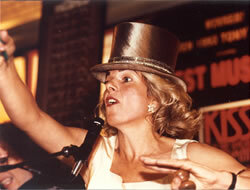 For years, Lorna Kelly worked as a fine arts auctioneer at Sotheby's in New York, and currently primarily works as a charity auctioneer - using her Sotheby's auction experience, special talents, and unique voice to raise funds and awareness for many causes. One organization which holds special meaning for Lorna Kelly is Broadway Cares, Equity Fights AIDS. 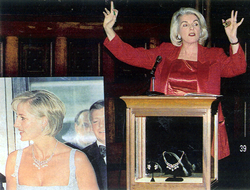 As a benefit auctioneer Lorna Kelly has helped that organization raise millions of dollars through its benefit auctions. Lorna ...raised more money than I had ever imagined! A first-rate charity auctioneer, Lorna understands how to generate excitement with an expert’s professional touch and a flair for fun—adding just the right amount of sophistication and compassion. As an example, Lorna helped raise more than $1 Million for the American Museum of Natural History. See event write up on the New York Social Diary. Charity auctioneer Lorna Kelly looks forward to helping you turn your charity auction or benefit gala into a financial, philanthropic and entertainment success. As a separate service she consults with charity board members and event organizers on how to prepare for the auction and maximize the financial yield at the event. Contact Lorna to disucss services and fees. This video highlights some of the most exciting moments with Lorna Kelly as the charity auctioneer - raisings vital funds in the process. To see other videos of Lorna, Click Here.